“The most important thing in my life is to do God’s will,” explained Sister Marybeth Culnan, OSF. “I try to keep in close touch with Him so that I will know what it is He wants me to do and when,” she added. Since 1983, Sister Marybeth has served her Franciscan Community as the Regional Vice President – Wisconsin through her work at Hospital Sisters Health System, Springfield, IL. 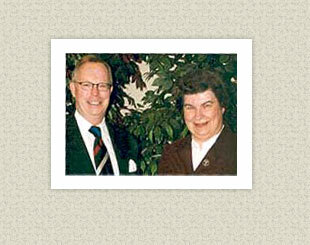 Furthermore, she serves as the Chairperson of the Boards of Directors for the Sisters’ sponsored hospitals in Wisconsin: Sacred Heart Hospital (Eau Claire), St. Joseph’s Hospital (Chippewa Falls), St. Mary’s Hospital Medical Center (Green Bay), St. Nicholas Hospital (Sheboygan), and St. Vincent Hospital (Green Bay). “I have attempted to serve the needs of these communities by guiding and supporting the administrators of our hospitals. I have seen many good things happen at our hospitals through our Sisters, our employees, our physicians, and our volunteers in what they have done and continue to do for the sick and the poor in our Wisconsin communities,” Sister Marybeth explained. There’s quite a distance between Springfield and these Wisconsin communities and Sister Marybeth admits that she has traveled almost every road in Wisconsin (except for those in the far north) and has lived through the construction (conversion) of many two-lane highways into Interstates. Born on January 1, 1939 in Lincoln, IL, she was the first New Year’s baby in Logan County. Her mother was of German heritage, her father was Irish, and she eventually became the oldest of three with one brother and one sister. “We grew up on a small farm where I learned to appreciate nature and the change of seasons,” she explained. Her first four years of grade school were spent in a one-room country school which was a one mile walk from her home. “It was my parents’ wish that we go to a Catholic grade school, of which there were two in Lincoln. So after I had finished the 4th grade, and after the high school bus was allowed to pick up country children going to religious schools, we finished our elementary education at St. Mary’s School in Lincoln,” she added. Many family members (including Sister Marybeth) and friends thought that the younger of the Culnan girls would become a nun. “God works in strange ways because my sister eventually got married and now has eight grandchildren and I became a nun,” Sister Marybeth said with a smile. She always wanted to be a nurse so after high school she enrolled at St. John’s Hospital School of Nursing, Springfield, IL. “I went there because it had a good reputation and it was close to home. I was the first one in our family to leave home and this was very hard on my father,” she said. It was here that she met the Hospital Sisters and was impressed by their willingness to do hard work, by their happiness in doing little things for others, and by their coming together for prayer. In her second year of nursing school, one of the Sisters asked her if she had ever thought about becoming a Sister; an idea she had considered. After a time of prayer and discernment, she entered the Community in 1960 – the same year she graduated from the nursing program. “My father was sad when I left home for nursing school and it was even harder for him when I decided to enter the convent. He said goodbye to me at our home in Lincoln because he knew he couldn’t bear to leave me off at the convent door,” she said. After completing her novitiate in the Community and receiving a bachelor’s degree in Nursing from Marillac College (St. Louis, MO), her first assignment was at St. Vincent Hospital, Green Bay, from 1966-69. She then received a Master’s degree in Nursing with a specialty in Neurological and Neurosurgical Nursing from Case Western Reserve University (Frances Payne Bolton School of Nursing) in Cleveland, OH. Again she returned to St. Vincent and served from 1971-75 as a clinical nurse specialist – Neuroscience. She was “happily doing God’s work” when she was asked to become a member of a Community renewal team who had been given the task of helping the Sisters renew religious life after Vatican II. The team was called Micro-Com as the members selected were a microcosm of the whole Community. From there she spent three years on the Provincial Council and then went back into nursing as a clinical nurse specialist - neuroscience at St. John’s Hospital, Springfield from 1979-1982. Three years later she was asked to become a member of the Boards of Directors of the 12 hospitals which the Sisters then sponsored. She then began her 26 year service at HSHS. “I have been somewhat removed from nursing for quite awhile now, but I see my current role as a very important ministry in HSHS and in the Church – and a nursing background certainly helps me in doing it,” Sister Marybeth said. “I am very grateful for the blessings and the opportunities God has given me to serve His people,” she added.